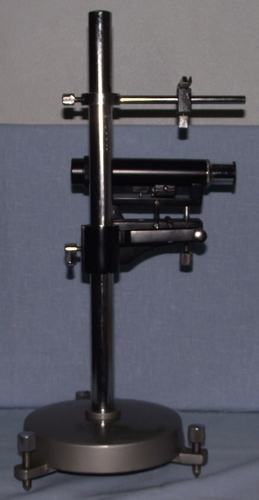 Backed with the team of highly qualified professionals we offer Slow motion Reading Telescope to our prestigious customers which is Heavy designed with slow motions provided to the brass tube fitted with achromatic Objective, X 10 Ramsden eyepeice cross line glass Graticule, translucent perspex scale. M/s Texla Scientific Instruments is a reputed enterprise established in the year 1993. Over the years company has established a reputation of providing quality laboratory products. Our products consists of all PhysicsLab Equipments like Spectrometer, Microscope, Optical Bench, Polarimeter, Rheostat, Telescope, and several other products & Electonic Lab Equipments like Variable & Fixed DC Regulated Power supplies , Measuring Instruments, Digital meters, Semiconductor Devices, Fibre Optics and several other Trainer boards. Texla products till date have received overwhelming appreciation, a fact that any of its long list of satisfied customers would vow for. Under the vigilance of our Director/founder, Mr. S. Manik Prabhu, the company has attained expertise and growth swiftly Since 1993 & Now Under the dexterous guidance of His Son's Mr. S. Shiva Krishna & Mr. S. Vijay Krishna we have been able to deal with all kinds of tribulations. We provide a personalized, genuine approach with an optimistic attitude towards our clients. We offer products of finest quality that guarantee enhanced performance and best value for money. Our company has integrated latest technology mechanism that assists in manufacturing massive quantities in bare minimum time.